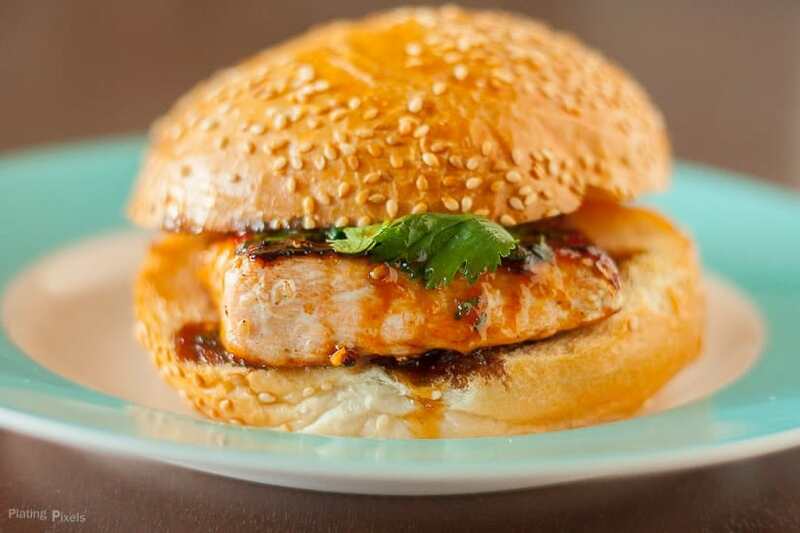 Sesame Salmon Burger with Apricot Soy Sauce Gaze. 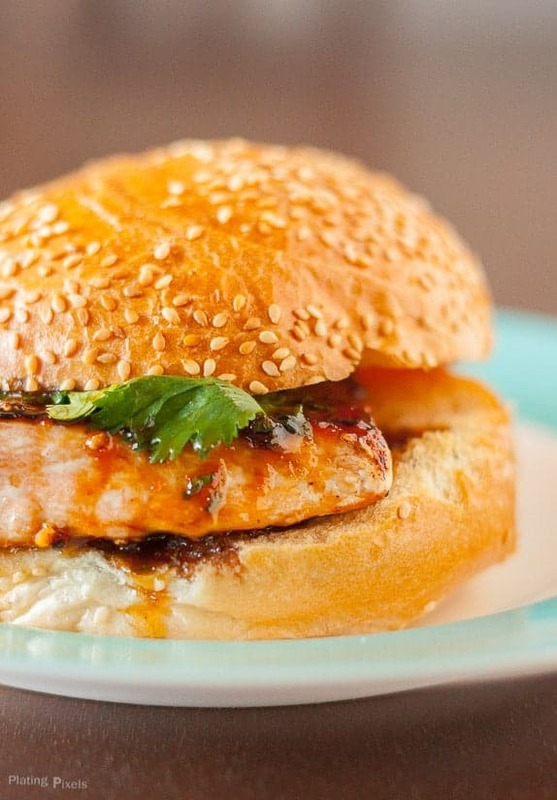 Sweet and salty salmon burger that’s fresh and healthy. Tender flaky fish with a fruity and savory finish. This is another dish inspired by my recent vacation to Kauai. The fact that it’s a seafood burger with sesame and soy sauce is tropical enough for me to claim it as Hawaiian. There is a wide variety of seafood, sushi and Japanese food available on the island, which is the basis for this recipe idea. I will be creating and posting more recipes from this vast source of culinary inspiration, so keep coming back for more. With only four ingredients in the glaze, each compliments each other perfectly. The sweet and salty apricot soy sauce glaze drizzles over the salmon steaks, voluptuously coating this fresh and healthy burger. Bite into the tender, flaky fish with a fruity and savory finish, and you’ll swear you’re eating on a beach-side bar and grill. You’re welcome for this brief escape to paradise. I shot this in natural light at 1/50 sec, f/ 2.2, ISO 800 . I was trying to photograph this recipe fast. To be honest, I wanted to eat the burger while the salmon was still warm and the bun still crispy. Assemble the burger as you would eat it, make sure the glaze drizzles over the side and down the bun to visualize it, and add a cilantro leave on the side for garnish and color contrast. A close-up shot shows all this in mouth-watering detail. A healthier bun to use would be whole-wheat, but I used sesame seed buns to show the viewer this important ingredient. The sesame crust on the salmon steaks would not show up well once inside the burger and with the glaze on top. Certain flavor sensations compliment each other well. The five flavors are sweet, sour, salty, bitter, and umami (or meaty). Spicy can also be a type of flavor. For the sauce, I paired sweet the sweet of the apricot preserves with the salty of the soy sauce. Fresh ginger adds a bit of spice. For another unique salmon recipe check out our Lemon and Dill Barbecue Salmon Kabobs. Note: You can barbecue or cook the fish in a pan for this recipe. I provide instructions for both. Place small saucepan over medium heat. Add all sauce ingredients. Stir and bring to low simmer, reduce heat and simmer for 5-10 minutes, or until sauce thickens into a glaze. Take off heat. Coat both sides of fish with salt and pepper to taste. Sprinkle both sides with even layer of sesame seeds, pat down to adhere to fish. To cook fish in a pan: Heat olive oil in medium pan to medium-high heat. Add salmon steaks and cook 2–3 minutes per side or until cooked completely. Fish should flake apart with a fork. To cook fish on the grill: Heat grill to medium high heat. Place fish on top of greased foil sheet (to prevent sticking and filling into cracks), close lid and cook 2-3 minutes. Carefully rotate and cook 2–3 minutes more, until opaque white flaky. Toast buns if desired. 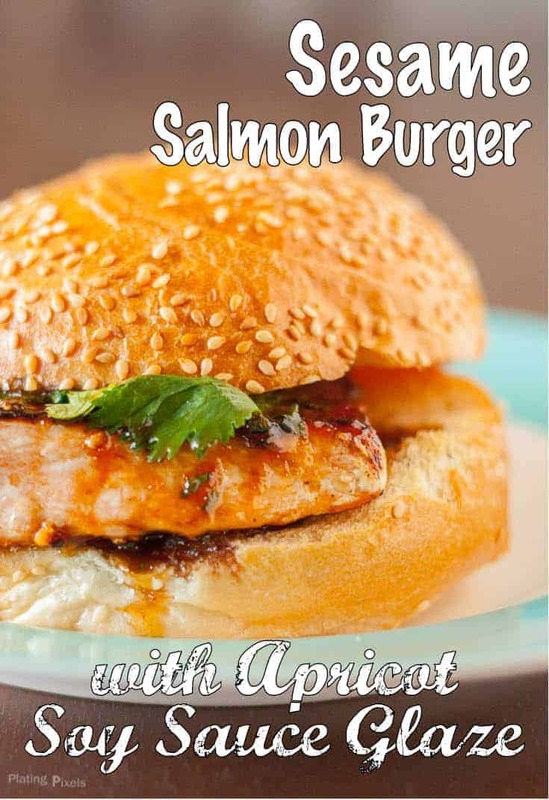 Place one salmon steak on each bun and drizzle with half of apricot glaze for each burger. Top with cilantro leaves for garnish and place other half of bun on top. love salmon burgers, need to make these sometime soon! What a fabulous burger! Salmon with an apricot glaze sounds perfect! Great flavor pop!